Throughout this series, we're going to be installing a lot of modules. If you're new to Drupal, we're going to illustrate in this video the traditional way to install a module by downloading it and moving it to your module folder. But there's better ways, and we'll be talking about those next. In this video we also configure the Administration menu to replace our existing top-of-the-page menu with a slick drop-down. Okay, so the fist module that we're going to install is called Administration Menu. This will give us a menu bar at the top of the page that's very similar to what you see here but it will have dropdowns that will allow us to access subpages of all of these. It can sure save a lot of clicks having it available. Now this is the first module that we're installing. So I want to establish a convention here that we're going to use throughout the rest of the videos. 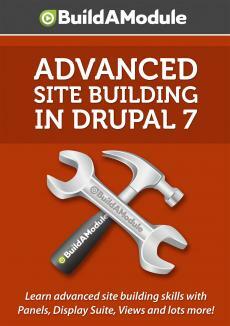 The most straightforward process to install a module involves searching for the module on the Drupal site. Let me demonstrate how that looks real quick. I'm going to open up a new tab and I'm going to search for Drupal administration menu. I'm going to click on this first one which is Drupal dot org slash project slash admin_menu and we would download this by scrolling to the bottom and downloading the recommended release for the version of Drupal we're using which is 7. The dot x means that we can be using any minor release of Drupal. Right now we're using 7 dot 19 but we could also use 7 dot 20 or 21, for example. I'm going to download the zip file and jump over to it in the finder. I'll unpack it, copy it, go over to my Drupal site, expand it, and we're going to put it in the sites all modules folder. Now we've explained in previous videos why it belongs here so we won't go into that in great detail, but as long as it's here it becomes available to us on the module listing page. So if we go to the browser and go to our site and we click on modules at the top and we scroll down, we'll see administration menu here.